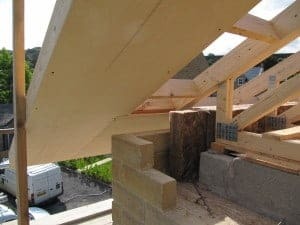 If you live in the Huddersfield/ West Yorkshire area you can contact our construction division Green Building Company, builders of the award-winning Denby Dale Passvhaus and Cre8 Barn projects. We work closely with Huddersfield architect Derrie O’Sullivan and can offer design, build, training and consultancy services for your newbuild or refurbishment project. It can be difficult to find building professionals who are interested in the environmental and health implications of their work. In general it must be said that the building profession is notoriously conservative in such matters. Members of the AECB (Association of Environment Conscious Building) are different. The AECB is the largest independent UK organisation promoting environmentally sensitive building. Membership is open to all, but is primarily composed of building professionals and product manufacturers. If you are looking for a building professional with a real interest in environmental issues, this should be the first place to try. Please remember that membership of the AECB is open. The only condition of membership is that all members must endorse the AECB Charter. The Association does not inspect members’ work or take up references. When taking on a member to undertake professional services you will need to satisfy yourself that the quality of their work is to a satisfactory standard and that they are suitably qualified.